Horses, excitement and tradition. 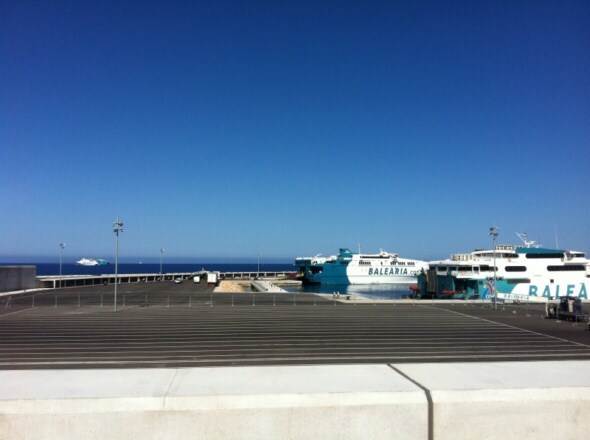 Each year there is a 'before' and 'after' in Minorca, after the San Juan Fiestas. 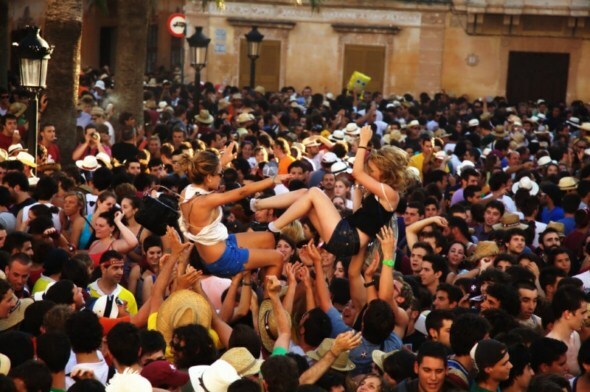 A fiesta which unites all the features which go to make up the personality of Ciutadella and its inhabitants. These are days when the happiness and excitement go with touching and running alongside the horses, the main event of the fiestas. Magical days for watching the dance of the sun at dawn and the explosion of polychromatic light which gradually fades throughout the year, a light which can only really be enjoyed to the full during the five days of the fiesta. San Juan is a popular fiesta, but it also celebrates the patron saint, and its medieval origins give it a mysterious feel which includes local Minorcans as well as our visitors. A tradition whose origins have been lost in the obscurity of the Minorcan Middle Ages. 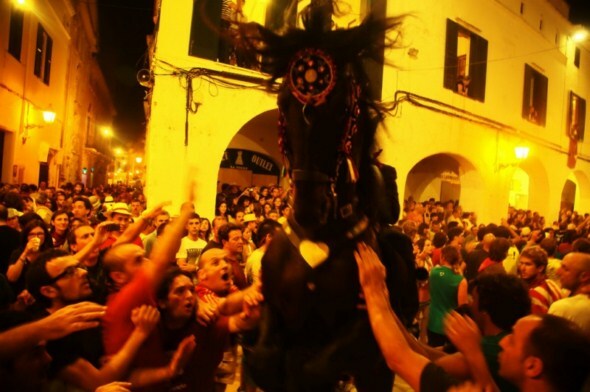 San Juan is a medieval fiesta where the main event is the fine Minorcan horse. 184 horsemen (and women) will make up the cavalcade this year, with more than 200 majestic Minorcan horses to stir the hearts of both local 'Ciutadellencs' and visitors. The Committee of 'Caixers' (riders) are the most important horsemen. The Committee is made up of six people who represent the different classes present in the old walled city. 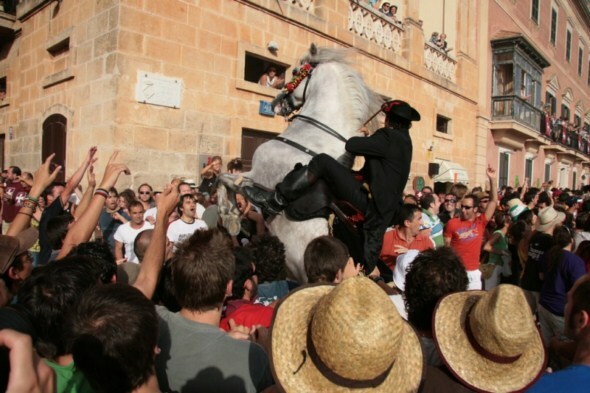 The 'Caixer Senyor' represents the nobility, a unique figure in the patronal fiestas in Minorca. 'Sa Capellana' (chaplain) is the Caixer who represents the clergy; 'Los Caixers Pagesos' (peasants) one from the north (Tramontana) and one from the south (Migjorn), Minorcan farm people. And lastly 'El Caixer Casat' (married) a tradesman, and the 'El Caixer Fadrí' (bachelor) who is charged with the honour of carrying the fiesta flag. San Juan has never been a static fiesta. It is a celebration in constant evolution which has adapted itself tp the social and cultural circumstances in Ciutadella. Historians agree on the religious origin of the fiesta, in particular the hermitage of St. John the Baptist, found seven kilometres south of the city. The first known references are from the year 1301, a few years after the conquest of Minorca by the Spanish King Alfonso III. The hermitage belonging to the old walled city was looked after by the 'Obrería de Sant Joan' a workmen's guild. Every year families and friends of the workmen made a solemn pilgrimage to the hermitage, this is the forerunner of the Caixers' Mass which is now celebrated on 23rd June. Two centuries later the small 'Obrería de Sant Joan' guild began to be administrated by a group of men chosen to represent the different classes present in the town. The administration of the hermitage was made up of an ecclesiastic workman, two farm workers and one journeyman. With time a 'Caixer Fadrí' was added to the administration of the guild, who from 1657 onwards was known as a 'Penoner' since he was in charge of carrying the San Juan pennant or flag. Throughout Europe during the XIV century mounted competitions were taking place, which also caught on in Ciutadella, although only the upper echelons of the town were able to take part . 'Día d'es Be' (The Day of the Ram) & St. John the Baptist. The two celebrations which come before 23rd & 24th June are 'Son Vetla' (the beautiful) and 'Es Día d'es Be' (the Day of the Ram). The latter is perhaps one of the most interesting and exciting days of the fiestas: it is the day when the first notes of the traditional fiesta pipe (Es Primer Toc de Fabiol) are heard, very early in the dawn, surrounded by silent people who explode with joy on hearing its fragile tones. The pipe is a wind instrument, similar to a small flute, which is always accompanied by the beat of a small drum. The main character of the day is 'S'Homo d'es Be' (the Sheep Man) who represents St. John the Baptist. He walks through the streets with a live ram across his shoulders, dressed in sheepskins and barefoot, having kept vigil until the early hours of the previous day. 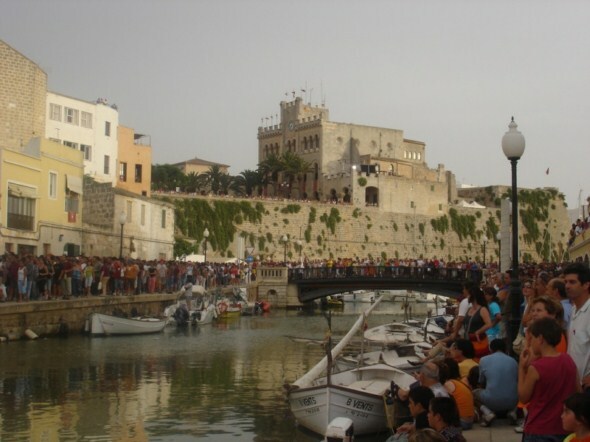 The day that Ciutadella joins with many other Spanish cities in the celebration of St. John's day. A magical vigil with a complete communion among participants from all the districts of Ciutadella. As night falls some thirty of the Ciutadella's neighbourhoods are lit up by the firelight from huge bonfires accompanied by a popular celebration with live music. 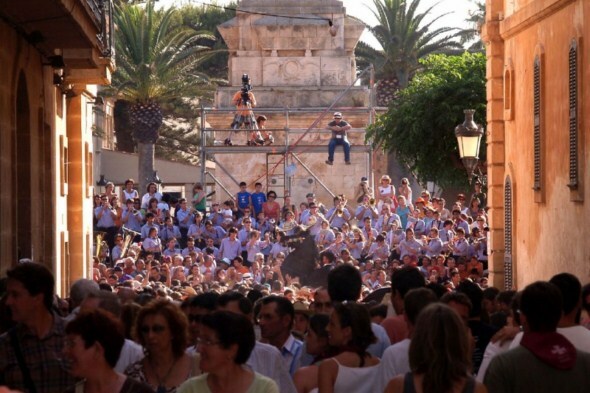 23rd & 24th June are the main fiesta days in Ciutadella. This is the festival which joins all local 'Ciutadellencs' in an impromptu brotherhood and floods the town with thousands of visitors from all parts of Spain and Europe. The festivities start on the 23rd at 2.00pm. The Fabioler (piper) arrives at the noble house of the Caixer Senyor and begs his permission to form up the cavalcade. A little later on the St. John's flag is handed over to the Caixer Fadrí by the wife of the Caixer Casat. Caixers and the other horsemen ('cavallers') all head in procession to the central Placa d'Es Born square where the first 'caragol' (horses rearing up with their riders) takes place. This is one of the moments everyone's been waiting for, especially when the caixer Senyor gallops into the square while the crowd opens up for the rider. It is at this instant that the Municipal Band stirs the crowd up playing the anthem of St. John. Following the caragol, the cavalcade heads out towards the hermitage of San Juan de Missa where the flag is dedicated to the fiestas of St. John the Baptist during a solemn Eucharist service, at the same time as the origins of the fiestas are remembered. The crowd now heads towards the Contramurada (the avenue which follows the plan of the old city walls) where a battle of thrown empty hazelnut shells (representing kisses) is carried on and local people take the opportunity to visit the houses of their families, friends and neighbours who will have prepared the traditional festival foods with ensaimada pastries, hot drinking chocolate, traditional biscuits, sweets, and above all gin with lemonade. When dusk falls the Caixers and Cavallers return to Ciutadella. They now celebrate the traditional 'Corregudes a Sa Plaça' (three turns on horseback from the Cathedral square to the Plaça Nova) and a 'caragol' for the nuns at the Santa Clara Convent, which completes the first day of San Juan in the early hours of the morning. San Juan doesn’t give the riders any respite; the day of the 24th begins at eight in the morning. The Fabioler (piper) once more begs permission from the Caixer Senyor to form up the cavalcade. The agenda of formal events is very tight. They make their way first to the Pla de Sant Joan (at the head of the harbour) in order to practice the ‘Jocs des Pla’ for the mounted competitions later on, followed by a series of formal acts fixed by the fiesta calendar which are completed by an invitation to the home of the Caixer Capellà (chaplain). The afternoon is for the local 'ciutadellencs'. The cavalcade forms up again and heads for the Town Hall where the 'Convidada' (formal invitation) takes place; when all the members of the Town Council are invited to come and watch the 'Jocs des Pla' mounted competitions down behind the harbour. That night another 'caragol' takes place at the Santa Clara Convent and this is the last event where the horses take part. Well into the early hours the 'Darrer Toc de Fabiol' (the last note of the pipe) is sounded at the house of the Caixer Capellà, an emotional moment when the local people bid farewell to the fiesta. Until next year, God willing. "Volem Gin Volem Gin Volem Gin!" Volem Gin Volem Gin Volem Gin! En beurem, en beruem en beurem! i Si no mos en donem no mues en narem!! volem estar aqui! i aqui estarem! !